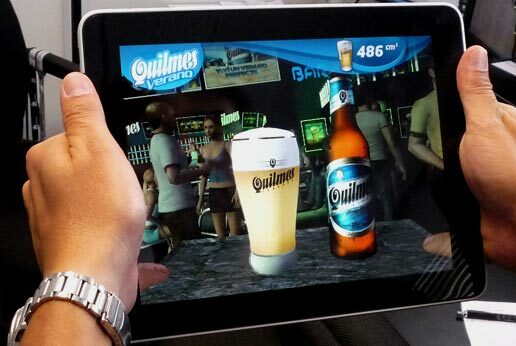 Game Ads – The Next Big Thing After Video Ads? We’ve already released a few articles about leveraging games in advertising, marketing and business to win the bidding optimization wars or to find the product market fit in case of startups. Today, we’ll focus on some new thoughts inspired by SXSW. In 2016, Gamewheel joined South By Southwest® (SXSW®) Conference & Festivals in Austin for the first time as part of the Berlin startup delegation, and the trip could not have been more inspiring. Little thanks to our #PartnerInCrime Openers for making this trip happen. With over 72,000 registrants and artists in attendance, SXSW is one of the most effective channels for bridging technology, creative, media and advertising spaces. This year’s conference was even more special because it marked SXSW’s 30th anniversary. To commemorate this major milestone – both the president of the United States as well as the First Lady joined the conference! This officially means that Gamewheel’s CEO presented alongside keynote speakers like Barack and Michel Obama, albeit not the same event, nonetheless we couldn’t be prouder! The Obama’s presence at the conference showcases the rising importance of the tech world in politics. Behind all the media attention focused at the prominent guests, SXSW once again offered a plethora of fresh insights that we cannot wait to share. Today, we’d like to focus on the discussion we had during the panel “How All Brands Can Win with Game Advertising” run by Susan Borst from IAB. The panel’s leading guests, Michael Flamberg (Nielsen), Kym Nelson (Twich) and Peter Jonas (Facebook), demonstrate the importance and relevance of gamification in advertising and the rise of games as a default part of the marketing mix. Showtime’s Game Ad for their new show Roadies, which was prominently placed into the SXSW conference app, further highlights gamification’s rise and predominance in the marketing world. Why Using Games in Advertising Now? The rise of mobile ads and Messaging apps and platforms, which are now already bigger than social networks according to Business Insider, has created a demand for an even more interactive and flexible ad format. 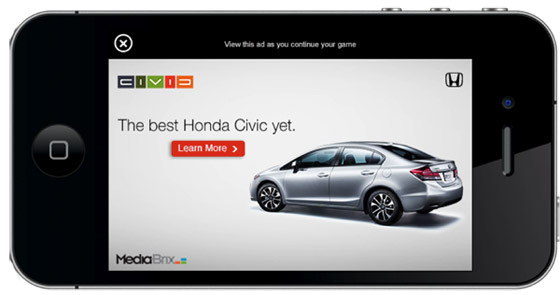 We call this next generation of online marketing: Game Ads. Game Ads are short interactions, with durations similar to Video Ads, that boast even higher engagement rates and deeper insights into user engagement. 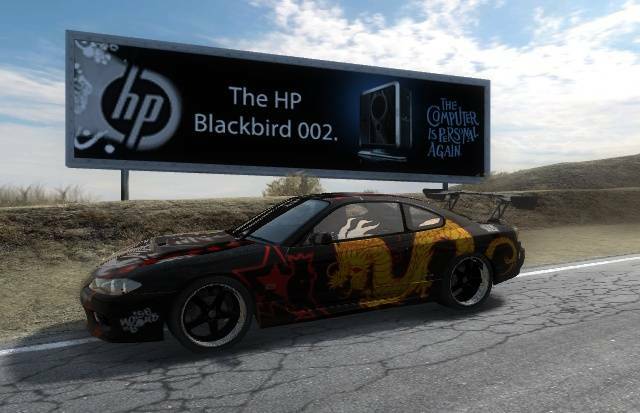 As there is no auto-play feature, a user has to interact with the Game Ad to finish it, resulting in higher brand value per session. Putting this in numbers – 79% of people aged between 18-44 have their smartphones with them 22 hours a day, seven days a week. More than 62% of adults and 85% of teens play mobile games. The staggering statistics don’t stop there, as AdAge recently pointed out , games are no longer a man’s domain – 49% of game players on mobile devices are women according to the latest data shared by Nielsen. So, let’s dive right into how to incorporate games into your advertising strategy. We’d like to provide our view on the typical scenarios of leveraging games in advertising based on our team’s expansive experience in creating games, building gaming studios and products, like the AR/VR focused studio Toywheel and our SaaS game builder, Gamewheel. 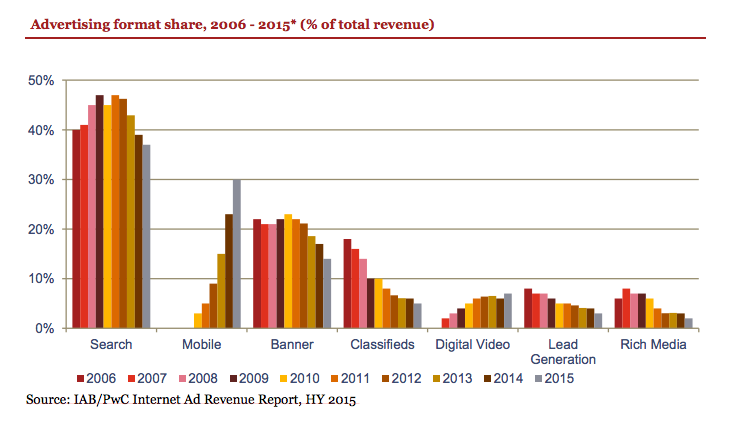 In the ecosystem advertising report by IAB, 3 types of game advertising have been highlighted. We’d like to extend this classification by a new game usage scenario number 4 – Game Ads. 4. Game Ads – Shorter version of Advergames with 15-60 seconds game play, which are “not trying to compete with full game experience”, but are running as part of an Ad campaign eg. in social media or in-app. We refer to Game Ads as also “mini-games”, “interactions” or “toys”. Those are mostly being used as part of brand engagement or content marketing campaigns to introduce a new brand/or new product, raise awareness or indirectly/directly explain a new specific feature or topic through simple game mechanics. With the rise of messaging platforms, leveraging such engaging and easily “personalizable” advertising formats, such as Game Ads is key to gaining more marketing traction. In fact, it creates a completely new use case: Game Ads could be placed inside of messaging groups, using multi-player or leaderboard game mechanics. 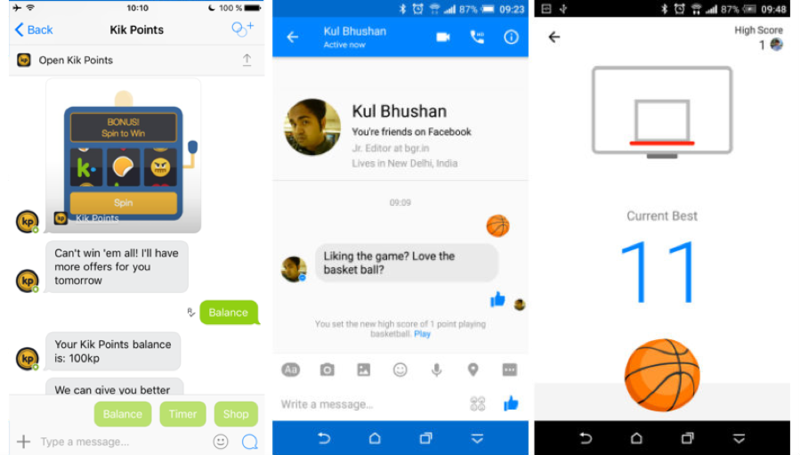 Moreover, those games are perfectly suited to work in combination with chatbots like virtual currency chatbot known from Kik (see screenshot below) and other messaging apps. We expect a lot of new features around the combination of Ad Games and Messaging platforms to be introduced during the f8 conference in April 12/13 in San Francisco, especially after the degree with which the secret basketball game went viral right after the SXSW Interactive conference. Game production costs have steadily declined over the last few decades, yet a significant budget and high-associated risk are still an inherent part of building any new game, even if it is a relatively small Advergame. The decline in production costs has been fueled by the rise of the indie games industry, which is powered by new game engines like Unity, and mobile ecosystems like Apple’s App Store. Still, most of the indie game studios can’t actually make a living out of their work. If you look closely at successful indie game titles like Monument Valley, you’d be surprised by just how much of their budget goes into production. According to Monument Valley founders, they spent $1.4 million for the eight-person team to create the game. Our team gets a lot of requests every day to evaluate game projects for all 4 scenarios described above, thus we’ve created this simple table to provide you with our typical budget estimates for the game content. Hopefully, this provides you with a “gut feel” for future decisions. Given the typically tiny budgets for Games in the advertising arena (see the overview table above), lots of agencies and indie game studios end up “reskinning” popular games or just copying exciting successful game mechanics with slight variation to match the brand brief campaign. Though, in this case most of the studios underestimate the cost and complexity of such “presumably small changes” and their implications to the game design & testing. It’s no surprise that most of those projects are notorious for being risky and not hugely successful. This is why we have created the platform Gamewheel, which offers a library of popular game types, that can be fully branded and edited online using the simple self-service wizard. 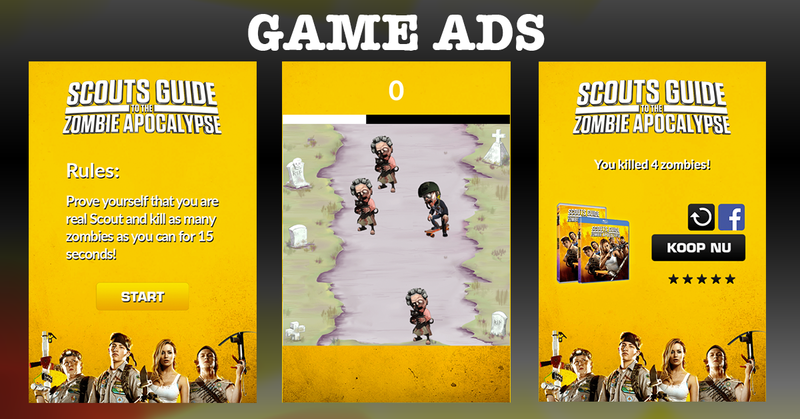 Each Game Ad can be connected with a reward through a customizable CTA destination leading to a landing page after the game. If you would like to learn more, here is a full guide how to build an Ad Game campaign without any fixed costs using Gamewheel. 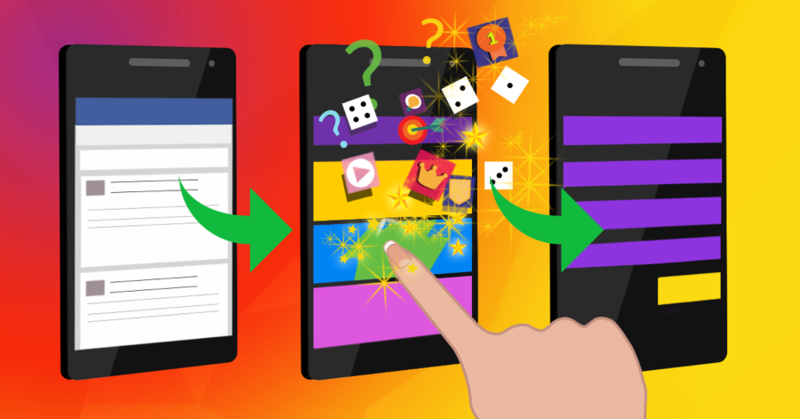 Besides zero development & test efforts, as well almost instant production time, another advantage of the Gamewheel approach is the ability to test multiple versions of game types using Dynamic Creative Optimization (DCO) platforms like AdGibbon or social media ad managers like Facebook at no additional cost. We’ll be detailing how to A/B or split-test an Ad Game campaign in the future on our blog as well as discussing the various game types available on the Gamewheel platform and what ad campaigns they’re best suited for. We’re also tirelessly working on a few case studies combining Game Ads and Messaging platforms to demonstrate the power of this new advertising terrain. You can find a first dozen here already. So, don’t forget to signup for a free Gamewheel account and to visit our blog regularly for all the latest updates and developments both at Gamewheel and within the online ad industry.